Dabur closed the week on positive note gaining around 2.90%. As we have mentioned last week, that the stock is trading at life time high so virtually no resistance lies. Resistance for the stock lies around 445 to 450. 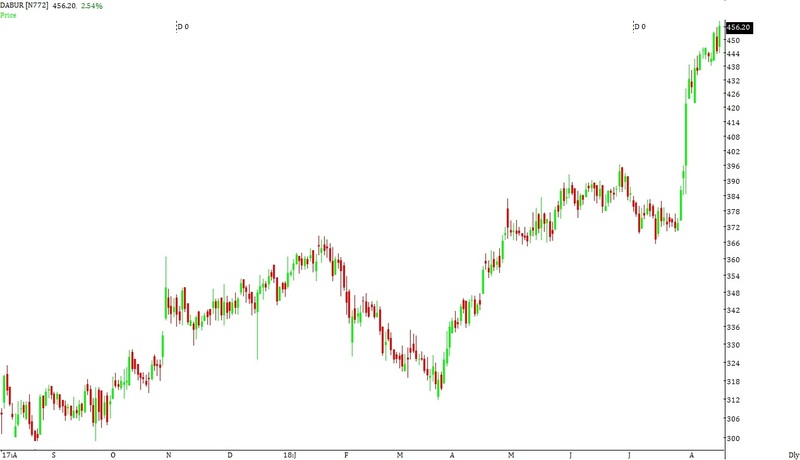 If the stock manages to close above these levels then the stock can move to the levels of 460 to 465. During the week the stock manages to hit a high of 459 and close the week around the levels of 456. Minor support for the stock lies in the zone of 435 to 440. Support for the stock lies in the zone of 420 to 425 where Fibonacci extension levels are lying. If the stock manages to close below these levels then the stock can drift to the levels of 395 to 400 from where the stock broke out of June-2018 highs. The stock is trading at life time high so virtually no resistance lies. Resistance for the stock lies around 460 to 465. If the stock manages to close above these levels then the stock can move to the levels of 475 to 480. Broad range for the stock in the coming week can be seen between 425 to 430 on downside & 475 to 480 on upside.